Color blindness causes patients, particularly men, to have difficulty distinguishing between colors. Several health conditions can cause and treatments are available. It is not actually a form of blindness, but a vision problem that causes people to have difficulty distinguishing colors. The most common type is red and green color blindness, though some will experience difficulty distinguishing blue and yellow. This condition is largely inherited genetically with men experiencing it around eight times more frequently than women. Patients may find that they have difficulty telling the difference between two colors such as red and green. While many people believe that these people tend to see shades of gray, you will actually see some colors quite vibrantly while others appear washed out, making it difficult to tell which color you are seeing. Your doctor can perform a color blindness test to determine if you have this condition or another vision problem. If you have been able to see a variety of colors previously and suddenly develop difficulty seeing colors you should contact your doctor right away. Gradually losing your ability to see colors or suddenly losing a portion of your color vision is often the sign of an underlying vision problem. 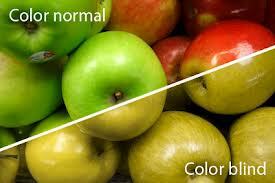 It is caused by cells in the retina failing to respond to the varying light wavelengths the eye uses to detect colors. These cells are known as the photoreceptors or rods and cones. Rods are sensitive to light while cones are responsible for detecting colors. Apart from genetic reasons, some conditions can cause a deficiency in the cones or cause some types of cones to be absent. Parkinson's Disease (PD). The neurological damage from Parkinson's disease can damage the nerve cells in the retina that are used to process your vision. Cataracts. Cataracts cloud the natural lens of the eye which can make some colors look washed out. Unlike genetic colorblindness, this color damage will be corrected after the cataracts are removed. Tiagabine. This antiepileptic drug is used to manage epilepsy symptoms, but may also reduce color vision by up to 41 percent during use. Leber's Hereditary Optic Neuropathy (LHON). This condition is an inherited condition that is most common in males. LHON is a type of optic neuropathy that will lead to red-green color blindness. Kallman's Syndrome. This inherited condition causes a failure of the pituitary gland, limiting gender-related development. It can also lead to difficulty in distingushing colors. Because many cases are inherited, genetic counseling can be used to determine your chances of passing this condition to your child. There is no cure for color blindness but there are strategies that can help these individuals function more effectively. Some research indicates that therapy to treat this condition will be possible someday, but these treatments are not yet safe to apply to human subjects. Some have found that their vision can be corrected by wearing special lenses that filter the light to increase the perception. Android and Apple apps are also available that will help people detect colors. Once people are aware they have color blindness they can learn to adapt to the colors they can see. Diagnosing this condition early can help to prevent children for experiencing learning difficulties at school. Many lesson plans in younger grades rely heavily on color recognition which can cause confusion for children that do not realize they are colorblind. Adults that have color blindness may need to avoid careers that rely on their ability to recognize a color scheme such as graphic design. It may be possible to take on these responsibilities with adequate training. Awkward social situations can be avoided by labeling your clothing and other accessories so you can pair items appropriately. Your health care professional or eye care practitioner can provide you with additional information or tools that can be used to assist with teaching your child how to manage colorblindness.